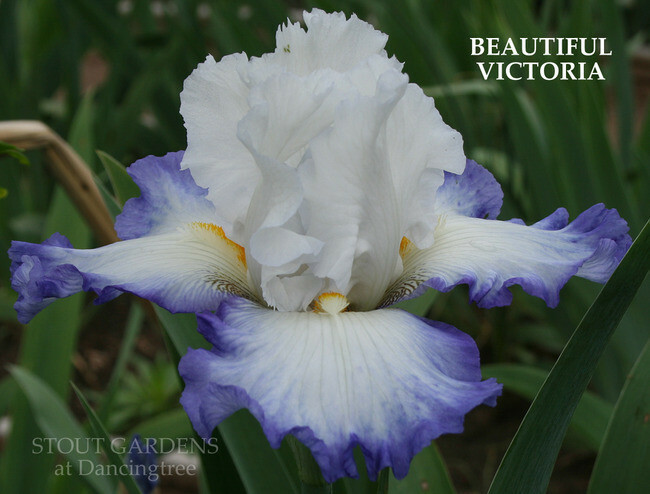 'Beautiful Victoria' (Anton Mego, R. 2010) Seedling# AM-03/1222-3. TB, height 36" (92 cm), Early to midseason bloom. Standards snow white, sometimes dentate edge; falls snow white, 1,5 cm wide blue border; beards white base tipped pale orange, white at end; ruffled; slight sweet fragrance. 'Queen's Circle' X seedling# AM-00/0539: (seedling# AM-96/0121: ('Conjuration' x 'Twilight Blaze') x 'Honky Tonk Blues'). Tall Bearded Iris Society 2011.